15th Anniversary Fat Boy-Injected - FLSTF-I. Cross Bones (EFI) - FLSTSB. Dyna Fat Bob (EFI) - FXDF. Dyna Low Rider (EFI) - FXDL. Dyna Low Rider (EFI) -FXDL. Dyna Low Rider - FXDL. Dyna Low Rider Sport - FXDLS. Dyna Low Rider-Injected - FXDL-I. Dyna Street Bob (EFI) - FXDB. Dyna Street Bob - FXDB-I. Dyna Super Glide (EFI) - FXD. Dyna Super Glide - FXD. Dyna Super Glide Custom (EFI) - FXDC. Dyna Super Glide Custom - FXDC. Dyna Super Glide Custom Injected - FXDC I. Dyna Super Glide Injected - FXD I. Dyna Super Glide Sport - FXDX. Dyna Super Glide Sport Injected - FXDX I.
Dyna Wide Glide (EFI) - FXDWG. Dyna Wide Glide - FXDWG. Dyna Wide Glide-Injected - FXDWG-I. Electra Glide Classic (EFI) - FLHTC. Electra Glide Classic - FLHTC. Electra Glide Classic Injected - FLHTC I. Electra Glide Standard - FLHT. Electra Glide Standard Injected - FLHT I. Electra Glide Ultra Classic (EFI) - FLHTCU. Electra Glide Ultra Classic - FLHTCU. Electra Glide Ultra Classic Injected - FLHTCU I. Electra Glide Ultra Classic Low-FLHTCUL. Electra Glide Ultra Limited - FLHTK. Fat Boy (EFI) - FLSTF. Fat Boy Lo - FLSTFB. Heritage Classic (EFI) - FLSTC. Heritage Softail Injected - FLST I. Road Glide (EFI) - FLTR. Road Glide Custom - FLTRX. Road Glide Ultra - FLTRU. Road King (EFI) - FLHR. Road King Classic (EFI) - FLHRC. Road King Classic Injected - FLHRC I. Road King Custom (EFI) - FLHRS. Road King Custom - FLHRS. Road King Custom Injected - FLHRS I.
Rocker C (EFI) - FXCWC. Softail Custom (EFI) - FXSTC. Softail Night Train (EFI) - FXSTB. Softail Night Train - FXSTB. Softail Night Train Injected - FXSTB I. Softail Slim S - FLSS. Softail Springer Classic (EFI) - FLSTSC. Softail Springer Classic - FLSTSC. Softail Springer Classic Injected - FLSTSC I. Softail Springer Injected - FXSTS I. Softail Standard (EFI) - FXST. Softail Standard Injected - FXST I. Street Glide (EFI) - FLHX. Street Glide Special - FLHXS. Street Glide Trike - FLHXXX. Super Glide Injected - FXD35-I. Tri Glide Ultra Classic - FLHTCUTG. 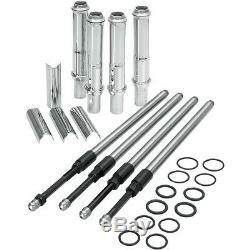 Kits includes four S&S QUICKEE pushrods, four pushrod covers, O-rings. Pushrods are manufactured from chromoly steel for superior strength. Installation does not require the removal of the rocker boxes. NOTE: Requires the removal of tappet blocks for installation. Great customer service is very important to us here at J&B Cycles. We are dedicated to our customers and will go the extra mile to make your experience nothing less of perfect. You may return any part within 14 days from the original invoice date. COD packages will not be accepted. Origin written on parcel label. The item "S&S Cycle Quickee Adjustable Pushrods With Covers For Harley Twin Cam 1999-2017" is in sale since Saturday, March 28, 2015. This item is in the category "eBay Motors\Parts & Accessories\Motorcycle Parts\Engines & Engine Parts\Camshafts". The seller is "jbcycles2002" and is located in Burlington, Wisconsin.